International Science Center and Science Museum Day (ISCSMD) is an annual global event demonstrating the impact and reach of the world’s science centers and science museums happening in 2018 on Saturday, November 10. Started in 2016, ISCSMD takes place each year on UNESCO’s annual World Science Day for Peace and Development, an internationally celebrated day to highlight the importance of science in and for society and that science, peace, and development are interlinked. It is a collaboration among the United Nations Educational, Scientific and Cultural Organization (UNESCO) and science centers and museums that belong to these global and regional networks of science-engagement organizations: Asia Pacific Network of Science & Technology Centres (ASPAC), Association of Science-Technology Centers (ASTC), European network of science centres and museums (Ecsite), North Africa and Middle East Science centers network (NAMES), National Council of Science Museums, Government of India (NCSM), Red de popularización de la Ciencia y la Tecnología en América Latina y el Caribe (RedPOP), and Southern African Association of Science & Technology Centres (SAASTEC). Science centers and science museums welcome more than 300 million visitors each year. ISCSMD is a reminder of the universality of science and its capacity to build bridges across geographical, cultural, and religious boundaries while addressing common concerns. On ISCSMD, science centers and museums celebrate and promote their missions together through widely diverse science engagement activities focused on the critical topics articulated in the global Sustainable Development Goals (SDGs) adopted by the world’s nations in late 2015. ISCSMD activities show that science and technology have a larger impact beyond economic growth and serve the greater good, for the planet and its people. This year, in celebration of the 70th anniversary of the 1948 Universal Declaration of Human Rights, UNESCO has selected “Science as a Human Right” as the theme for the annual World Science Day for Peace and Development on November 10. The theme is directly aligned with the focus of the 17 SDGs. You are invited to take part and highlight how “Science as a Human Right” is a part of your work in your communities. The goal is to amass an inventory of ideas and actions that illustrate how science centers and science museums “operate across geographical, economic, political, religious, and cultural barriers.”1 We hope that this inventory will inspire dialogue and further action. Does your institution strive to be a beacon for diversity and inclusiveness in your community? 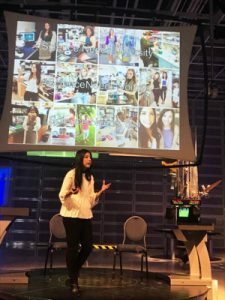 Could a successful initiative from another science center, which brings together children from different cultural and economic backgrounds for robotic programming, help to heal divisions in your community? Might learning that a very small science center is doing programs for inmates in a local jail lead you to consider undertaking a similar action? Would seeing what others did in 2018 to celebrate the first international LGBTSTEM Day inspire you to participate next year, creating new connections? Might reading about how a science center engaged immigrant or refugee families stimulate you to do something to welcome newcomers and help them to become part of your local community? In addition to contributing to the inventory, you are invited to accentuate your programs and initiatives linked to diversity and inclusiveness on November 10 in your plans for ISCSMD. We can all learn from such sharing of experiences. To get the ball rolling, we are sharing some of the related initiatives the Ontario Science Centre has put in place over the years. Located in Toronto, Canada, which is often named the most multicultural city in the world, the institution welcomes almost 1 million visitors annually from many different backgrounds. While this is a reflection of Toronto’s cosmopolitan makeup, it is also influenced by Ontario Science Centre’s commitment to inclusion and diversity and a core belief that science is for everyone. We have chosen three examples – local, national, and international – to illustrate our approach. Our Spotlight on Science program first focused on women in science, technology, engineering, and mathematics (STEM) during UNESCO’s International Day of Women and Girls in Science, and Spotlight on Women in STEM is now offered throughout the year. This program features local speakers of different ages and backgrounds sharing their personal stories. Presenters have included a citizen scientist in the third grade; a teenage co-founder of STEM Kids Rock; a science and technology writer from Canadian public radio; and the Dean of Science at Ryerson University, an international advocate for equity, diversity, and inclusion in science. The event is moderated by an Ontario Science Centre teacher who is also the founder of STEMneutral, an educational program designed for teachers and students that addresses the implicit biases that both women and men have that can create barriers for women and minorities in STEM. A program supporting the notion that science is for everyone is one the Ontario Science Centre offers in partnership with the Institute of Canadian Citizenship. Since 2011, this Cultural Access Pass program provides all new Canadians and their families with the opportunity to visit participating cultural attractions for free during the first year after they are sworn in as citizens. This program reinforces the position that science is part of the culture of Canada and is a right that should be available to everyone. In addition to providing these passes, every year the Ontario Science Centre hosts an official Citizenship Ceremony in which scores of new immigrants become Canadian citizens. For many of them it adds a special meaning that the place where they officially became a Canadian is a science center. And for us it is an honor to play this role. During the inaugural LGBTSTEM Day on July 5, 2018, the Ontario Science Centre held a public event featuring a Science Slam with several speakers, moderated by a Toronto engineer (and graduate of the Ontario Science Centre Science School) in his drag persona, Conchita. The speakers addressed the question, “Is it important to have out and proud people in STEM?” from their own personal experiences. Visitors were invited to show their support via the LOVEisLOVEisLOVE.org onsite photo booth and to share their images on social media. The ‘500 Queer Scientists’ photo display encouraged people to think about who is a “scientist” and who looks like a “scientist” in their mind, part of a visibility campaign for LGBTQ+ people and their allies working in STEM. What can others learn from your own work in welcoming all and providing science learning experiences to the people in your communities, regardless of their age, educational attainment, ethnic background, financial resources, gender, sexual orientation, or other dimensions of diversity? The programs and initiatives you are already pursuing—and the stories behind how you have started them, what you are learning, and where you are heading—are of great interest to your colleagues in other organizations around the world. Click here to discover how you and your organization can join in ISCSMD.